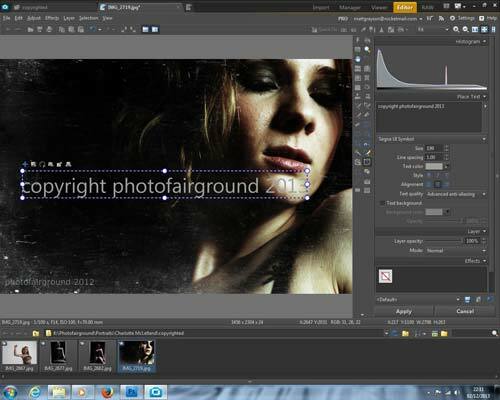 Photo Studio 16 from Zoner is an editing, tagging and organising software application for your photographs. Zoner say that it's the best one available. In this test, we'll be tagging and editing to the hilt to see if that claim has any basis. Photo Studio 16 costs $44 for the Home edition or $89 for the Pro edition. Both can be downloaded from the Zoner website. Installation of Zoner Photo Studio 16 is fast at around 20 minutes on our super slow half meg broadband connection. Installation only takes a few minutes if you use the Quick download option. 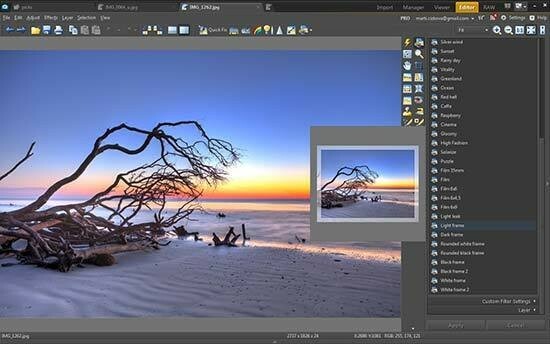 Zoner Photo Studio 16 is a stand alone program and looks like Adobe Lightroom, Cyberlink Photo Director 5, Corel Paint Shop Pro X6 and any other tagging and editing suite on the market today. Given the similarity of the layout, we're extremely interested to know what makes this the best editing suite available. It has some hot competition to beat. The program has five sections to it: Import, Manager, Viewer, Editor and Raw. The Import page will fetch pictures directly from anything attached to the computer or you can select a folder. You can also do this by going directly to the Manager page. 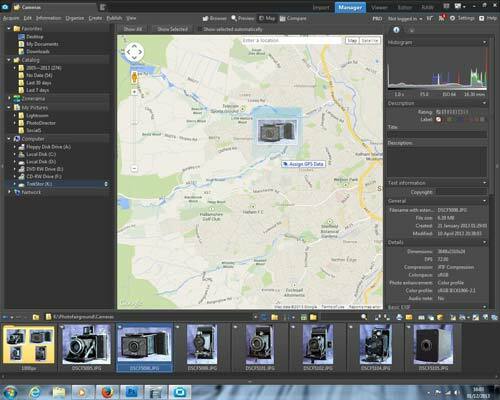 In fact, Zoner Photo Studio 16 automatically opens on the Manager page. The general layout of the Manager page is split into three sections. To the right is another Import section, which kind of makes the import page redundant. The centre section has a large preview of the image you've selected. If you don't want to use the ticker style browser on the bottom of the window, you can clock on Browser and the images will cascade through the middle window. Click on Preview and you're back to the default setting of your selected shot where you can check any part of it, rotate, preview, zoom in and check the blown out areas of the shot. If you click on Map, you can add any geo-tagging information by dragging pictures onto the map. It's worth noting that the map will only work once you've created an account on the Zonerama section of the website. You can create one by clicking the Not Logged In button at the top right corner of the window. Select the type of account you have and enter your details. You'll need to reboot the program and log in again after confirming via email. One of the new features to Zoner Photo Studio 16 is the integration of Facebook albums to your Zonerama account. Now if you've linked your Facebook albums to your Zonerama account, any time you upload images to the Zonerama acount, it automatically updates onto Facebook. Zoner Photo Studio 16 has a dedicated page to checking the picture you've chosen called Viewer. It's a great area to look at your photographs without the complications of all the fussy menus scattered either side. The black background helps to cancel out distractions, although there is some options around you. In the top corner, you can give the photo a rating and a colour tag. This allows for faster searching in the future. 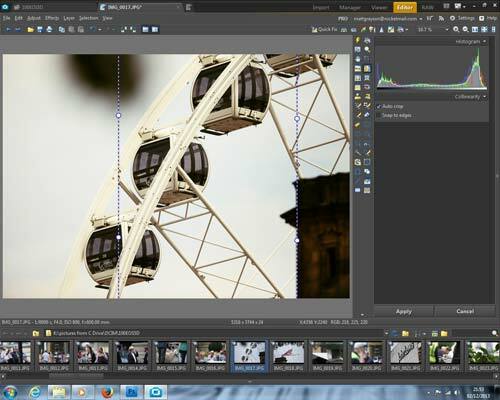 Adobe revealed content-aware cropping in CS4 which was released in 2008. Now, five years later, Zoner have included it in their program. They're not the first ones to use it, but it's good to see more stand-alone independent companies utilising the technology. 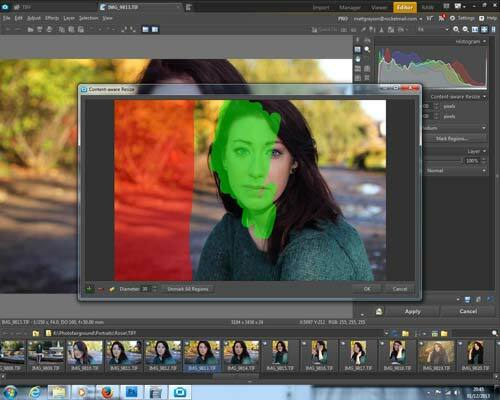 You can also determine areas of the image that you definitely want to keep by using the Mark Regions window. You simply colour the bits in green that you definitely want to keep and red for the bits that can definitely go. Otherwise the program automatically decides whether you need them or not. 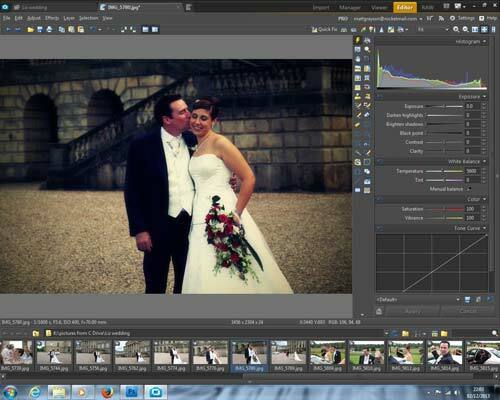 Other cool features in the Editor are the Quick Filters which will apply a number of vintage and retro filters to the photographs. There's also a number of frames to make the pictures look like they've been taken on film. Of course, you could just get a film camera and get the real thing, but if not, these look pretty good. 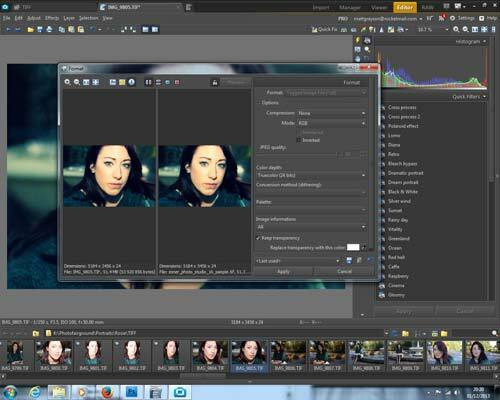 They don't have the precision and random generators of more dedicated programs, such as Alien Skin's Exposure 5 but it's good to have it if you might use it rarely. The Clone brush seems to have been removed and only a Healing tool remains. The Healing tool isn't bad. In fact, it works very well. However, there are some areas where it won't erase over completely, like a Clone tool would, it works in the same way the Patch tool does in Photoshop. Shadows and the like won't be affected, but spots are removed. We had an item we wished to cover completely though, and it took several clicks to apply enough layers. You can alter the intensity under the Histogram, but we sometimes couldn't get it strong enough.